We are a top restaurant supply distributor of baking Fruit Fillings for cakes and pies and desserts. Our lemon fillings are super popular for lemon filled doughnuts. We also carry chocolate and vanilla pudding pie fillings. Kraft Jello Pudding and Pie Filling Coconut Cook and Serve - 24 Oz. 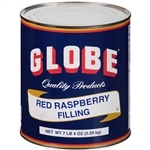 Lawrence Foods Blueberry Filling - 0.75 Gal. Lawrence Foods French Bavarian Cream Filling - 20 Lb. Lawrence Foods Instant Meringue Powder Filling - 25 Oz. Lawrence Foods Whole Strawberry Filling - 19 Lb. Kraft Jello Cheesecake Mix - 4 Lb. Kraft Jello Pudding and Pie Filling Chocolate Pudding - 4.5 Lb. Kraft Jello Pudding and Pie Filling Vanilla Pudding - 4.5 Lb. Glaze Strawberry - 20 Lb. Bavarian Creme Filling - 2 Lb. Fruit Fillings and pudding fillings for pies are important ingredients in baking. Get the best deal on baking ingredients here for your pies and cakes.